Optical fiber connectors are used to join optical fibers where a connect/disconnect capability is required such as in a patch panel, a telecommunications outlet and a patch cord. The connectors can be terminated in the field. They can also be assembled onto optical fiber in a supplier’s manufacturing facility. Most optical fiber connectors are spring-loaded, so the fiber faces are pressed together when the connectors are mated. The resulting glass-to-glass or plastic-to-plastic contact eliminates signal losses that would be caused by an air gap between the joined fibers. 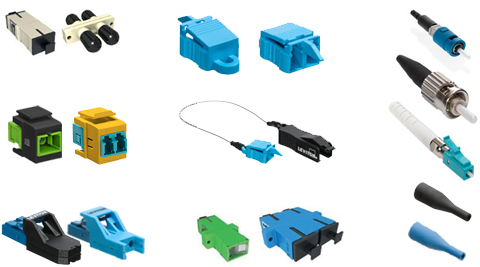 There have been many different types of optical connectors used in the industry. However the most popular connectors are SC, LC (small form factor connector), some legacy networks use ST and FC connectors. All these connectors are available in various termination types such as scribe & polish (epoxy, anaerobic adhesive, mechanical crimp) and pre-polish. Connectors are identified with colored boots. The TIA 568 color code for connector bodies and/or boots is Beige for OM1, Black for OM2, Aqua for OM3, Erika Violet for OM4, Blue for singlemode fiber, and Green for APC (angled) connectors. The fiber end face is either UPC (multimode and singlemode) or APC (singlemode). The connectors are aligned and held in place in a mating adapter or coupler. Connector styles and colors match the connectors.